After lackluster performances in August and September, the U.S. economy went back into high gear for the month of October. On November 6, BLS announced that the U.S. economy created 271,000 jobs, much higher than Wall Street’s expectation of 180,000. That’s a big increase over last month’s weaker-than-expected 142,000 new jobs. (BLS has since revised August’s and September’s employment gains to add 12,000 jobs for each month.) The unemployment rate remains unchanged at 5 percent, but the civilian labor force participation rate was also unchanged at 62.4 percent. The Federal Reserve is considering the first rate increase in a decade following this month’s strong employment numbers. The Open Market committee will hold its last meeting of the year in mid-December, and the Feds will have one more jobs report before making their decision. Chairwoman Janet L. Yellen has consistently argued that the current economy can handle higher borrowing costs. However, a rate hike will likely strain several states—such as Illinois and California—as well as the federal government, that are operating in the deep red. Higher borrowing costs may significantly impact state and federal deficits as the burden of annual interest payments grow larger. 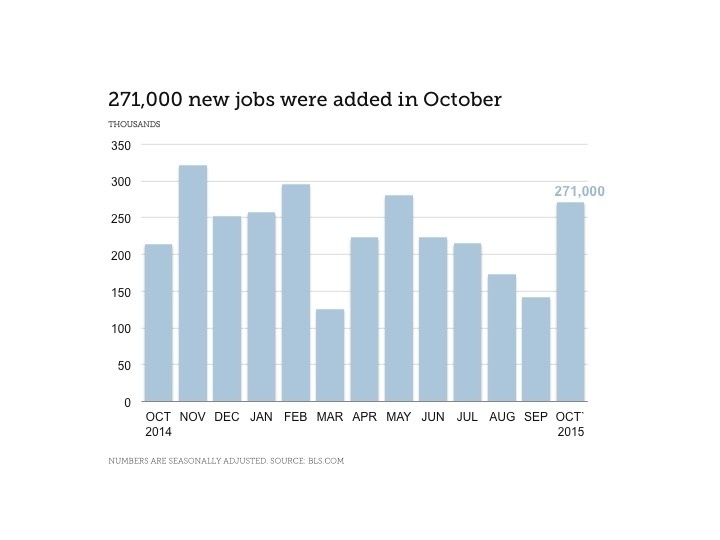 According to the government’s Nov. 6 data, most of the employment gains occurred in professional and business services, health care, retail trade, food services and drinking places, and construction. Experienced job seekers continue to see strong hiring demand from employers. That’s especially true in areas that have a big talent gap such as healthcare, IT, accounting and finance. Also, certain industries have plenty of vacancies needing to be filled, such as professional and business services, retail and construction. Managers and executives will also need to adapt with the times. Many companies are focusing on governance, risk management, international opportunities, compliance, and IT and data security. So job candidates may be prudent in moving away from legacy practices and learn new skills (such as digital marketing) and emerging technologies. Employers are looking to innovation to remain competitive in the marketplace. More than ever, employers have more tools, such as social media, to seek and find top talent. Many companies have a preference to bring in experienced candidates, instead of new graduates. With Baby Boomers headed for the exits, recruiters will need to sustain their talent pipelines so key jobs have continuity and succession management.